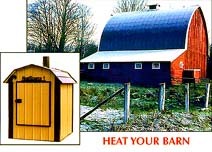 *Burning wood in a HEATSOURCE 1 outdoor wood furnace is an inexpensive, hassle free heat source. 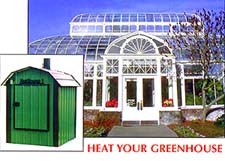 HEATSOURCE 1 operates on a simple but very efficient principle. The furnace heats water to its optimal heating temperature which is constantly maintained by automatic controls. The heated water is then piped underground through insulated pipes to the desired location; this transfer of water is more efficient than forced air. A circulation pump continuously circulates the heated water to provide proper heat distribution and ensure that the desired temperature is maintained. A domestic hot water assembly is available which attaches to your present hot water heater to provide you with a near constant flow of hot water for your home use. The versatile design of the HEATSOURCE 1 make it compatible with existing heating systems: hot water, forced air, radiant baseboard, water-to-water, and in-floor. The installation is easy and allows HEATSOURCE 1 to be used as the primary heat source or in conjunction with your current heating system. Your home is one of your biggest investments. It's where your family spends a great deal of time. And you spend a considerable amount of money making it comfortable and enjoyable. Firewood can be dirty, moldy, and riddled with insects, which can create a mess in your home. Burning indoors means smoke, ashes, odors, and an eventual buildup of soot on your walls and ceilings, not to mention heat loss caused by hauling firewood in and ashes out. With HEATSOURCE 1 outdoor wood furnace, you avoid all of these problems. Many customers have noticed that using HEATSOURCE 1 for heating (thereby eliminating indoor burning) has helped alleviate respiratory and allergy problems. And, they've found that HEATSOURCE 1 allows them to heat additional buildings, such as a garage, shop, barn, greenhouse or even a swimming pool - with a single heating unit.